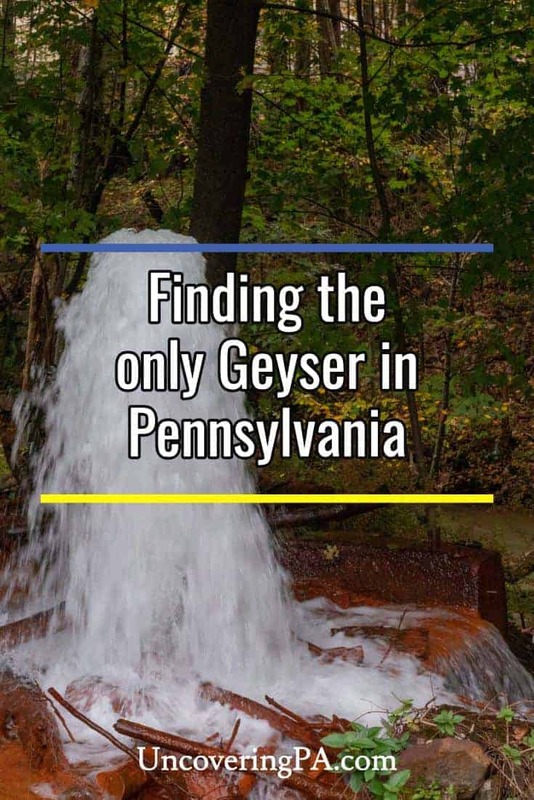 Did you know that Pennsylvania is home to a geyser? 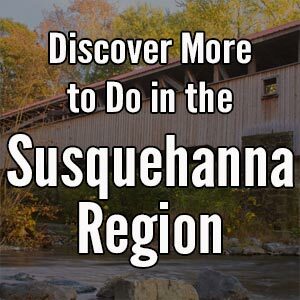 While it might not be natural, the Big Mine Run Geyser in Schuylkill County is still quite interesting to see, especially since there are no natural geysers on the east coast of the United States. This geyser sits just outside of Ashland, Pennsylvania, just a few miles from the famous ghost town of Centralia. It is unofficially known as the Big Mine Run Geyser after the road that it is along. Ironically, the geyser is not a part of Big Mine Run, nor does it run into it. Instead, the water runs about 20 feet down the hillside and into Mahanoy Creek. The geyser flows out of the ground and down a short hill into Mahanoy Creek. 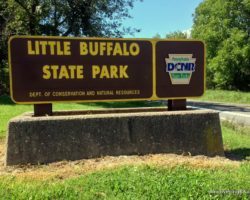 Like the natural geysers you find in places like Yellowstone National Park or Iceland, the geyser in Pennsylvania’s Schuylkill County is caused by immense underground water pressure. However, unlike natural geysers that rely on underground aquifers, Big Mine Run Geyser relies on water in the mines far below ground to fuel it. The hole from which the geyser emerges was an air hole drilled for ventilation (though other sources say it’s caused by a burst pipe from the drainage system). The hole runs an estimated 300 feet down into a mine shaft of Bast Colliery. The Bast Colliery was active from 1853 until it closed in 1934 (around the same time as the nearby Pioneer Coal Mine in Ashland). The mine produced nearly 10 million tons of anthracite coal and left miles of shafts far below ground. After the mine closed, the shafts filled with water, and, with nowhere to go, some of that water eventually began to shoot out of the ground here. The geyser sits just a few feet from a residential road in a wooded area. The ground below the geyser has been dyed a bright orange coal thanks to the high levels of minerals in the water. According to reports, during heavy rains in the spring, the geyser can shoot up to 12-15 feet into the air. However, on the day I visited in mid-October, it was a mere 3-4 feet in height. If you visit during a time of low water, it’s possible that the geyser might not be visible at all. However, if you can manage to visit when its flowing, it’s impressive to see a geyser in Pennsylvania. 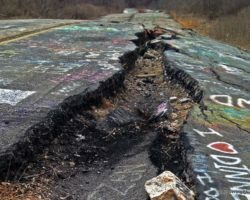 So, the next time you are visiting Schuylkill County or Centralia, take a short trip to see one of PA’s strangest oddities. A closer look at Big Mine Run Geyser. 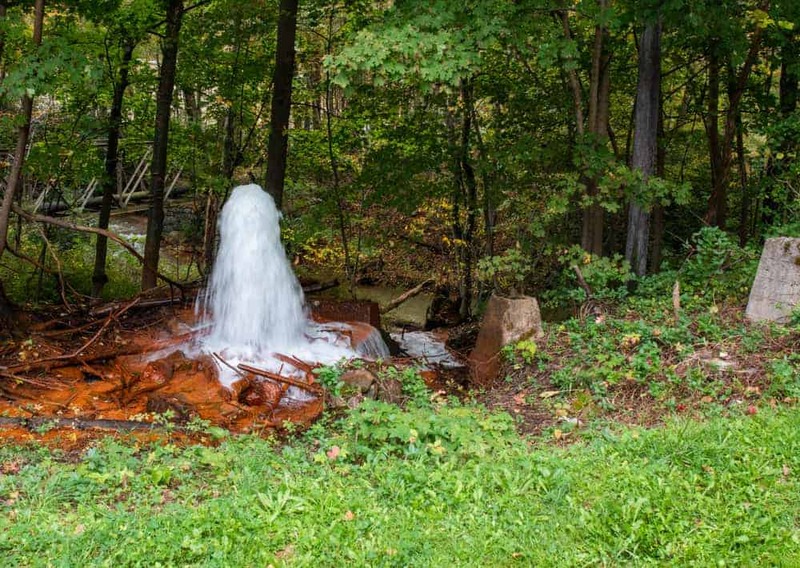 Big Mine Run Geyser is located just outside of Ashland and Centralia in Schuylkill County near Route 54. 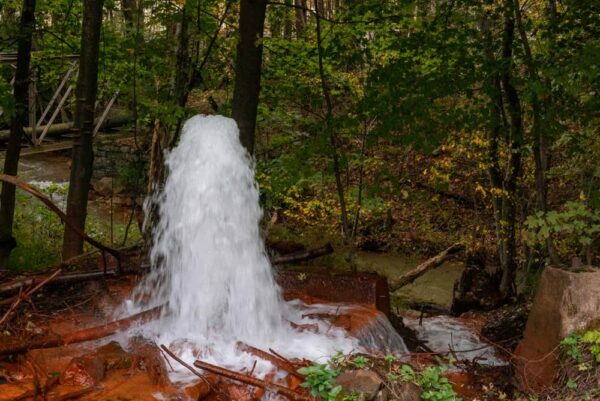 The only geyser in Pennsylvania is located along Big Mine Run Road at the following coordinates: 40.786478, -76.318852. There is enough room along Big Mine Run Road for a car to pull over. Note that the geyser is on private property, but is only about 15 feet from the road. Please respect the property and view the geyser from the road. Looking for more oddities? 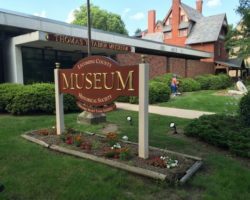 Check out the Coudersport Ice Mine, Gravity Hill, and the Triple Continental Divide.